Social media and screen-time: To ban or not to ban; that’s probably not the question. Home > Blogs > Social media and screen-time: To ban or not to ban; that’s probably not the question. Informed by evidence from academics, royal societies, health officials, social media companies, young people, teachers, government ministers, research funders and more, the Science and Technology Committee report on the impact of social media and screen-use on young people’s health covers a range of issues: from risks, harms and benefits, regulations and guidance, to resources for schools and teachers. While respecting data protection principles, social media companies should make anonymised high-level data available, for research purposes, to bona fide researchers so that a better understanding of social media’s effects on users can be established. The Government should consider what legislation needs to be in place to improve access by researchers to this type of data. 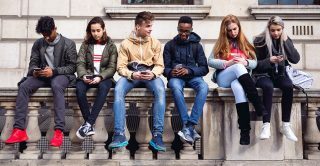 As a matter of urgency, DCMS should commission research focused on identifying who is at risk of experiencing harm online, and why, and what the long-term consequences of that exposure are on the young person. To ensure that policy is evidence-based, and that the research needs of Government departments are met, departmental ‘Areas of Research Interest’ documents must be accompanied by periodic funding calls. Such calls need to take place ahead of an area becoming the subject of a major policy initiative. Fundamentally the report recognises that “social media is a relatively new phenomenon and, consequently, there is not yet a well-established body of research in this area examining its effects on children”. The evidence that does exist can be confusing, with some finding a link (association) between the use of social media and screen time and children’s mental health, whereas others are more nuanced in their findings, emphasising that causality cannot be ascertained and urging the need for caution in basing policy on what is still an emerging field of research. To help address this, the Committee calls for the Department for Digital, Culture, Media and Sport to commission new research as a matter of urgency. Research using the UK’s longitudinal studies will be key in improving the current evidence base and helping understand the complex effects over time. As we set out in our evidence to the inquiry: we currently do not fully understand the long-term effects of social media and screen use by young people, limiting the ability of policy to intervene effectively, and therefore need to conduct research using the existing longitudinal studies to track prevalence of social media and screen-use over time and uncover the long-term impacts on young people’s health. Relevant CLOSER studies are the Avon Longitudinal Study of Parents and Children (also known as Children of the 90s), Millennium Cohort Study, and Understanding Society. Importantly, new methods of data collection such as children’s time-use diaries will help researchers evaluate links between children’s activity patterns and subsequent outcomes in health and wellbeing. The Committee’s report is not only measured and comprehensive, it is also timely: acknowledging societal concerns whilst also recognising that “scientific research is currently insufficiently conclusive”, the UK Chief Medical Officers advice for parents and carers builds on this wholly sensible guide produced by the Royal College of Paediatrics and Child Health and recommends that the Chief Scientific Advisor for the Department of Health and Social Care should convene a research seminar to identify the avenues for undertaking and funding future research in this area. A White Paper (policy documents produced by the Government that set out their proposals for future legislation) on Online Harms is expected to be published later this year, which will set out clear expectations for companies to help keep their users, particularly children, safe online. Looking beyond this specific topic, the Committee turns its focus to the government areas of research interest, or ARIs (documents that set out the main research questions facing government departments). These are of increasing interest to researchers and are currently being refreshed, discussed by the Government Chief Scientific Adviser (Sir Patrick Vallance) in a session on his work and priorities at the end of last year. Feedback I have sought from academic colleagues on the existing ARIs has underlined the lack of (and desperate need for) incentives to substantively engage with the questions raised in these documents in any meaningful way – this is recognised by Norman Lamb’s Committee in their call for the ARIs to be accompanied by periodic funding calls, an incentive that is badly needed for what is currently a set of inconsistent and, in many cases, dated documents (some have not been updated since 2017). Note that later this year, CLOSER will commission a piece of research looking at the suite of ARIs to map existing longitudinal evidence and data available, showcase the opportunities the studies provide for delivering new policy insight, and help inform any future funding calls. Watch this space for more news about our work in this area.